Some time ago I knew only so much about Australian art – I might recognise who a painting was by and know a little about the painter. When reading a book like Patrick McCaughey’s new tome Strange Country: why Australian painting matters, I took it as gospel. Today not a lot has changed – except regarding matters discussed on this website. On these I have more detailed knowledge. So when a friend loaned a copy of her newly acquired Strange Country and asked what I thought of it, I turned first to the chapter on Nolan where the pages fell open at his painting Mrs Fraser. This certainly was familiar territory (see Nolan’s “Mrs Fraser”: Reconstruction and Deconstruction). This is almost completely incorrect. The book gives no reference for this errant account, and indeed I know of no single source in the literature containing all these inaccuracies. She was not the sole survivor – others survived both the shipwreck and the longboat voyage and walk which followed; the name of the convict associated in popular legend with her rescue is David not William Bracefell, his correct surname is Bracewell not Bracefell although the incorrect version remains in use, and another convict David Graham was her actual rescuer; she was not led by the convict to settlement and safety, but rather to a rescue party of marines and convicts waiting at a pre-arranged spot 100 miles from the settlement; she did not betray him to the authorities; and Bracewell most definitely was heard of again – he himself being rescued from the bush, receiving his ticket of leave and dying near Ipswich when felling a tree for his employer. As chance would have it, he was buried in Brisbane’s first cemetery (long since built over) across the river and only a few hundred meters from where today Nolan’s Mrs Fraser rests on her wall at QAGOMA. I like to imagine that on moonlight nights, when the guards aren’t looking, she might sneak off the wall, trundle across Grey Street bridge and keen by his remains. But back to inerrancy. Should we take as gospel, background in books like this? One wonders – it can prove disconcerting when, as above, one has the knowledge against which to pit authoritative statements. Perhaps more than biblical inerrancy deserves challenge. That said, there are plaudits aplenty for McCaughey’s book, and not least from this writer. The book is beautifully presented in the easy visually appealing style and layout one has come to expect from Meigunyah Press. The 350 pages abound with almost 300 faithfully reproduced colour images of works selected by the author to argue his case across a dozen or so chapters, three of which concentrate on single artists: Drysdale, Nolan and Williams. The writing style is easy, conversational even, with a fine balance maintained between biography, backgound information and analysis. The book is very readable, most pleasing to the eye, and provides a logical, erudite and masterly overview of Australian painting. Those wishing to have an accessible introduction to the painting of this country could do no better than commence with Strange Country. For me though, the book is most about seeing and learning to see. We are privy to how a well-tutored and insightful eye catches fire, to borrow William Blake’s phrase, when viewing painting which so obviously does matter to the beholder. And from this most of us can learn. We learn to progress beyond the merely visible and wonder at the unseen, even though mystery it may remain. In this sense McCaughey’s book is wonderfull. With much positive comment, is it pedantic or curmudgeonly to quibble with questions posed on the inside front cover flap, or with the statement on the back cover? McCaughey is admirably placed, by dint of both experience and scholarship, to pose these questions and answer them. Director of the NGV for most of the 1980s, he was then Visiting Professor of Australian Studies at Harvard, and between 1988 and 2001 he was successively director of the Wadsworth Athenium and the Yale Center for British Art. He directed the Festival of Ideas at University of Melbourne 2009-11. 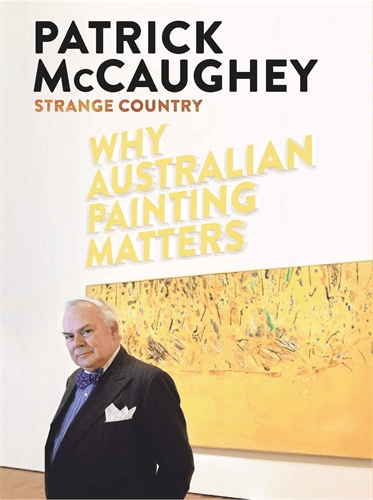 There can be little doubt that McCaughey makes out a compelling case as to why the breadth of painting he reviews should matter to us all. Moreover he does so convincingly and with a convivial ease often missing in what can seem elitist and patrician utterings from the likes of Kenneth Clark, notwithstanding Clark’s depth of intellect and scholarship. And could a commentator have made the point more cogently or succinctly than does McCaughey? 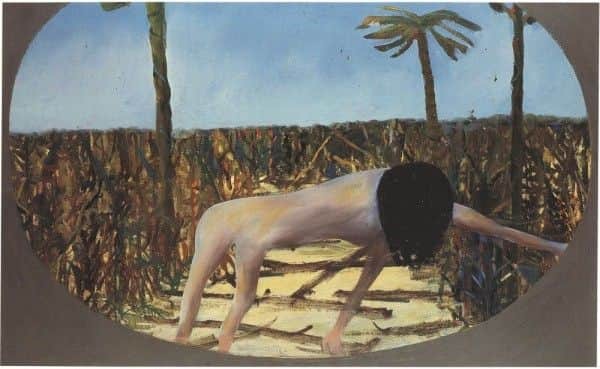 I am less convinced though that the book itself argues why Australian painting is particularly unique in this regard; why its art is more powerful and original than that of other countries, or why our art matters more to us than does the art of another people to them. Agreed, but the same comment could well be made of Caspar David Friedrich’s Monk by the Sea and other paintings of the Romantic Sublime. 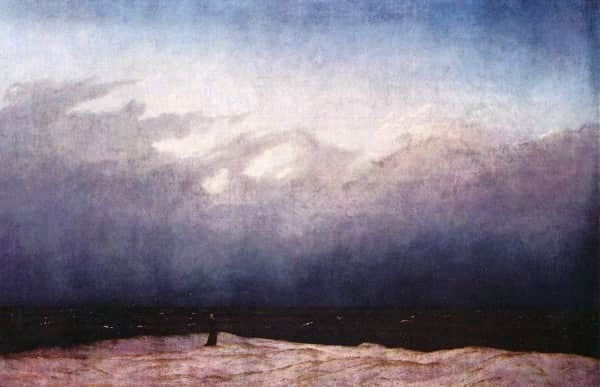 “The Monk by the Sea”, 1808-1810, Caspar David Friedrich, Alte Nationalgalerie Berlin collection. Indeed the book contains little by way of comparison between Australian art and that from other countries. Consequently the claim that Australia produces such original and powerful art, and that it matters to us as it does in few other countries, seems to have been asserted rather than conclusively argued. Such comparative analysis would make for rewarding research and reading. Why Australian Painting Differs – a sequel perhaps? Neither does the book really address the question of why our art is so little known beyond our shores – which has less to do, I venture, with any lack of promotion or being undervalued, than with the innate parochial and tribal tendencies of people. Just ask your average gallery goer to name more than three artists (if that many) from, say, Canada or South Africa …. even New Zealand. 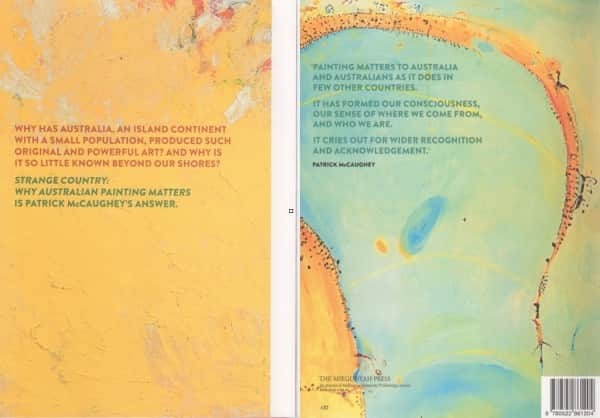 Here is perhaps one reason why painting does matter in Australia as in few other countries, and why there is not wider recognition and acknowledgement abroad. Thank you, David, a splendid set of corrections. I hope you are sending it to Patrick himself, as there is no doubt that he would welcome the opportunity to revise his account. You should also send it to the publisher, and vigorously complain about the passing of the good old days when publishers used to put manuscripts out to competent readers before going into print.